Posh manager Grant McCann (left) is thrilled with Junior Morias' winning goal against Wigan. Photo: Joe Dent/theposh.com. Club legend Craig Mackail-Smith celebrates his 100th Posh goal. The bare statistics suggest Posh haven’t progressed at all in 2017. On December 31, 2016 Posh were eighth in League One having amassed 38 points from 24 matches. They were two points outside the play-off places. On December 31, 2017, Posh were eighth in League One having amassed 38 points from 25 matches. They were three points outside the play-off places. Chelsea skipper John Terry is sent off against Posh. 2017 yielded 23 wins and 23 defeats in all competitions. But statistics are similar to political opinion polls as you don’t have to believe them. In fact they are often best ignored. Former Posh players at the unveiling of the Chris Turner statue at the ABAx Stadium. 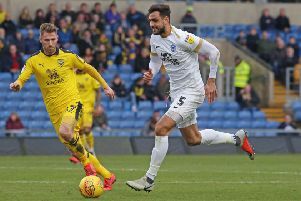 Posh certainly have a much bigger attacking threat this season (unless they are playing against nine men) and trading Tom Nichols for Jack Marriott was a masterstroke which proved the club’s scouting system is capable of moments of genius. The spine of the team appears solid. Anthony Grant (unless he is playing against nine men) is an outstanding midfielder of his type and Marcus Maddison is playing out of his skin. His wonder goal against Shrewsbury this season was a standout moment of 2017. Posh became the first team to beat Shrewsbury in League One this season (amazingly on October 28) and won a cracking ding-dong of a game against Wigan at the ABAX. But the jury remains out on first-team boss Grant McCann, a manager who oversees runs of good and bad form and who has yet to inspire promotion-winning home form. Eleven defeats at the ABAX (14 wins) in a calendar year is far too many. Five arrived in League One this season compared to three in each of the last two promotion seasons from this division (2008-09 & 2010-11), and in just over half of the available matches. And yet Posh found themselves within a win of the play-off places as 2018 arrived. Chairman Darragh MacAnthony will be a key man this month as his ability to fend off inevitable interest in Maddison and Marriott as well as his willingness to strengthen a squad now hurt by another lenghty absence to star man Gwion Edwards will come under scrutiny. Posh were often excellent in 2017 and they were often hopeless. The last two games of the year, played just four days part, were perfect proof of this team’s frustrating inconsistency. Brilliant at a top side in Bradford City and then hopeless against a depleted out-of-form side like MK Dons. In fact Posh managed excellence and hopelessness in the same game at Charlton in November as they threw away a well deserved 2-0 lead in injury time. At the start of the year Posh lost more heavily at Bury (1-5) than Chelsea (1-4). The former was one of the more dispiriting results and performances of 2017 and Chris Forrester’s collapse in form after a superb personal effort at Stamford Bridge was a big lowlight of the year. Chelsea away also provided one of the funnier moments as John Terry was sent off after Lee Angol (now at Mansfield) left him on his backside. Other highlights included Craig Mackail-Smith’s 100th goal for the club, and few seemed to care that it was a fluke in the last moments of a 2-1 home defeat at the hands of Oxford, and McCann’s skill at arranging derby day victories. Northampton were stuffed most pleasingly 4-1 at Sixfields in August and a first trip to Cambridge United for 15 years ended in a 2-0 win. Few cared it was a Checkatrade Trophy tie as travelling support of over 1200 proved. Off the field Posh fans raised a staggering £80,000 in a few months to commission and erect a statue of club great Chris Turner outside the ABAX Stadium. The players and staff chipped in as they did to support the club’s Free Kicks Charity Day to confound those who believe football folk are all cynical and self-serving. But it’s on the pitch matters that are most important of course. Posh finished 11th last season which at least stopped a constant decline, but, for many, nothing less than a top-six finish will suffice this season.